On November 2nd, 1920 (ninety-seven years and one day before the exhibition opening) the world’s first commercial radio broadcast was heard on KDKA Pittsburgh, then known as 8ZZ. Utilizing technology developed by engineer and enthusiast Frank Conrad just a few blocks from Powder Room, the voice of Leo Rosenberg relayed presidential election results to a rapt local audience before the arrival of the next morning's newspaper. It was, at the time, a historically speedy conveyance of information. 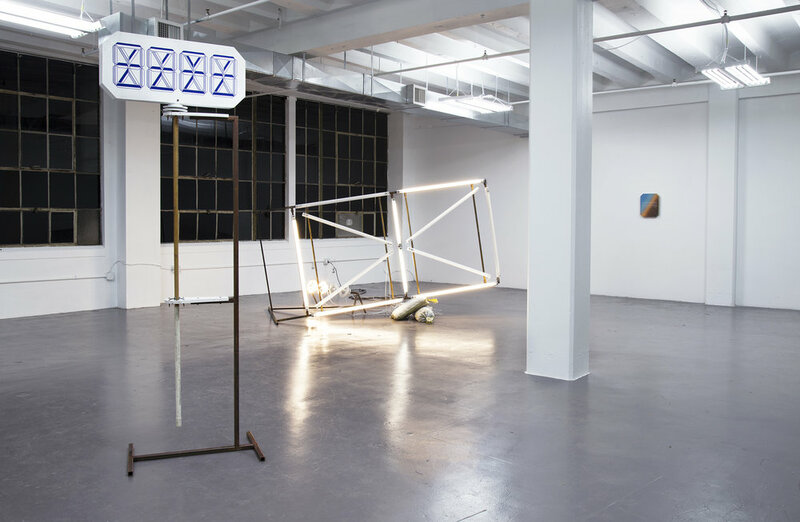 87.5 to 107.9, 530 to 1710 presents new sculptures and paintings by Alex Lukas examining this space of breakdown. Interrogating the aesthetics of radio both historically and in speculative post-apocalyptic futures, Lukas’ work examines removal of the lifeline provided by terrestrial broadcast. 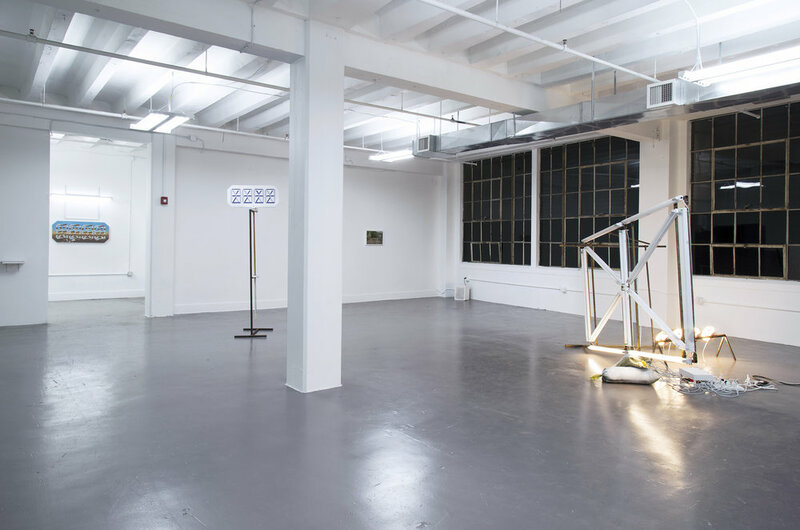 Through a series of works utilizing the format of the digital display, an efficient form capable of replicating the English alphabet, select punctuation, and digits 0 - 9, Lukas presents relics of radio in an imagined future. 87.5 to 107.9, 530 to 1710 is supported in part by funding from the Carnegie Mellon University Frank-Ratchye Fund For Art @ the Frontier. Alex Lukas was born in Boston, Massachusetts and raised in nearby Cambridge. 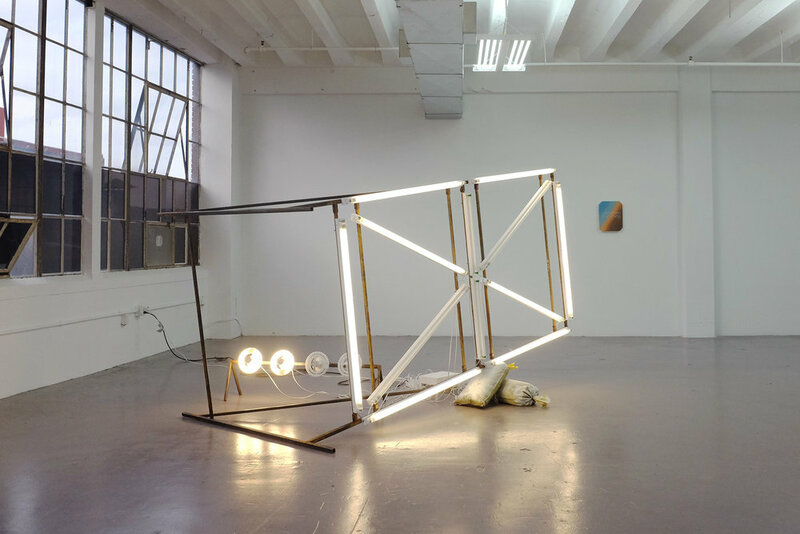 With a wide range of artistic influences, Lukas creates sculptures, prints, drawings, photographs and intricate publications alongside long term research based projects and audio collages examining the intersection of public and private spaces. 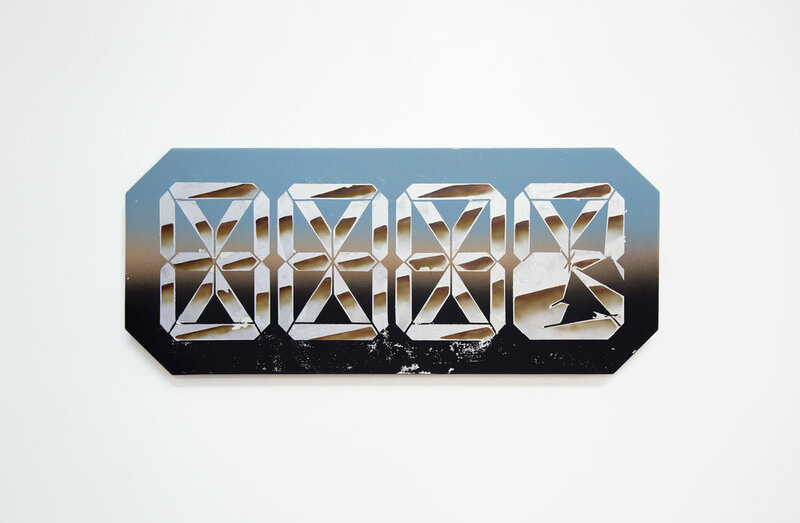 His work has been exhibited in New York, Boston, Philadelphia, Los Angeles, San Francisco, London, Lima, Stockholm and Copenhagen as well as in the pages of Megawords, SFAQ, Pacific Dissent, Proximity Magazine, Dwell Magazine, Juxtapoz and Art New England. His work is included in the collections of the Philadelphia Museum of Art, The Spencer Museum of Art, the MIT List Visual Arts Center Student Loan Art Collection, The Flaxman Library at the School of the Art Institute of Chicago, The New York Public Library and the Museum of Modern Art Library, New York. Lukas has lectured at The Rhode Island School of Design, The Maryland Institute College of Art, Alfred University and The University of Kansas. He has been awarded residencies at The Bemis Center for the Arts, the Ucross Foundation, AS220 and The Jentel Foundation. Lukas received a BFA from the Rhode Island School of Design and, after stints in Chicago and Philadelphia, moved to Pittsburgh to pursue a Masters of Fine Art degree at Carnegie Mellon University.